Every year we give out a number of grants from our specified and general funds. As well as giving out grants through our grant application process, our Board Members also proactively work together with key people and organisations in our community to identify specific projects that we believe will truly 'Advance Ashburton'. Below are a selection of stories from some of the organisations, events and individuals that have received funding from Advance Ashburton Community Foundation. To see a more detailed list of our distributions to the community, check out our 'Distributions' page. 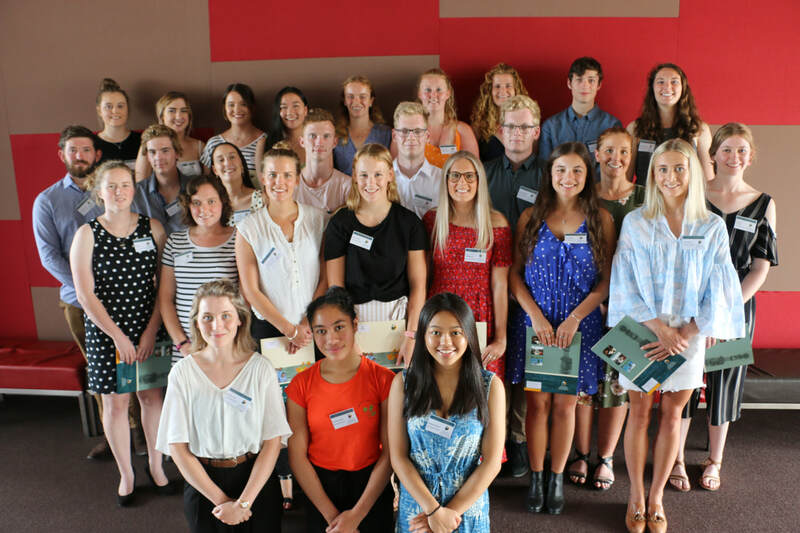 Through the generosity of our donors, Advance Ashburton were privileged to award $73,500 to 31 scholarship recipients for 2019. Congratulations to all our scholarship recipients. We would also like to say a huge thank you to our donors, who make these scholarships possible, and to our sponsors; Ashburton Trust Events Centre, Argyle Welsh Finnigan and Forsyth Barr. Anyone that has been to the dentist knows that it is an expensive industry. As a third year dental student I pay huge amounts in fees, and on top of that am expected to find the money to pay for any equipment we need. I am so fortunate and grateful for Advance Ashburton as they have allowed me to invest in equipment, such as my LumaDent light, which makes me a better dentist and I will use throughout my career. Being supported by my community also gives me a massive sense of belonging and encouragement knowing that there are people who back me in becoming the best dental professional I can be. Next year I’ll be entering my fourth year of dentistry which will be a busy one, with more clinics and more time spent with patients. I’m sure I will continue to love what I am doing and will continue to work hard improving my knowledge and skills. I’m so thankful for the support from not only Advance Ashburton, but from everyone in general. From my parents and friends to the people I meet in our community who have no idea who I am but continue offer kind and encouraging words when I tell them I’m studying to be a dentist. ​Applying for the Advance Ashburton Leadership Scholarship was one of the best things I could have done. I love spending time water skiing and boating, so it was only fitting I use my scholarship to help fund a voyage on the Spirit of Adventure which I completed from April 22nd to May 1st. Sailing on the Spirit of New Zealand was the best trip I’ve done, and any holiday would struggle to beat it. I wasn’t sure what to expect but had heard many reviews that it was an awesome trip and I knew I’d love it as it involved water. All 40 of us kids were put out of our comfort zones, whether it was climbing the masts, sailing in little luggers or putting the masts away in rain and wind. But the genuine support from each voyager, meant we could complete that task and the laughs and smiles. My favourite part of the voyage were the morning swims. It was so incredibly awesome to wake up, get into our togs and jump into the fresh water for a wash and some relax time. Although it seemed cold at first, you soon warmed up with the swimming bus that went around the ship a few times. Some mornings it was hard to get out! Not knowing anyone on the voyage, but meeting everyone and becoming great friends, meant we could be ourselves and didn’t have to try to be someone else, like we would in the real world. I made some lifelong friends and enjoy keeping in contact with them, but most importantly, I gained an experience I will cherish forever. A huge thank you to the Advance Ashburton Trust, more specifically the Jaycee trust for the scholarship, the memories and friends I got from this experience, will last me a lifetime. Having not studied since leaving school at 18 years old, I felt a mixture of excitement and nervousness about doing the Project Management Course through ARA and had to teach myself how to study again. I have completed and passed the first two terms, with the last two terms starting up again in October. I just want to thank Advance Ashburton again, being an adult study was daunting for me and to have received this grant really motivated me to try my hardest and prove to myself no matter what age you are, you can always challenge yourself. I am currently studying a Bachelor of Nursing at Otago Polytechnic and I am really enjoying it. I have been on a placement in the Dunedin community and I am just about to start an aged care and hospital placement. Last year I was very fortunate to receive the Advance Ashburton Community Foundation scholarship to help me towards my studies. I have put the scholarship to good use, using it for textbooks and equipment needed for my course. Once I have completed my degree, I hope to work in a rural area and study towards becoming a Nurse Practitioner. I have also been very fortunate to be able to continue rowing as part of the Otago University rowing team while studying. In July, I travelled to China as part of the Otago University womens eight where we competed in the International Universities Rowing Regatta in Changsha and gained second place. I would like thank the Advance Ashburton Community Foundation for the opportunities this scholarship has provided as a stepping stone for my nursing career. Advance Ashburton Community Foundation are very pleased to provide an essential grant to the Financial Capability Budgeting Service provided by Presbyterian Support so this valuable service can continue to be available for the people of Mid Canterbury. For nearly twenty-five years, the Ashburton Budget Advisory Service helped thousands of people with budgeting advice and education. The initial budgeting service that was set up in Ashburton wound up in late 2016 and, due to the services own careful financial management, had accumulated funds. In early 2017 these funds were transferred to Advance Ashburton where a named fund was created. Advance Ashburton are now pleased to be able to grant this money back to supporting budgeting advice in the Ashburton District. Presbyterian Support tendered to run the replacement budgeting service to which they were successful, and this service remains available to help people take financial control. Su Hutchison, Services Manager Presbyterian Support Ashburton, reports that finances often govern a fair amount of people’s lives. It has been recognised through work completed at the Budget Advisory Service, that money worries can drag people down and can often link in with feelings of anxiety, and depression. However, if time is put into organising finances, this can have a long-term benefit to many aspects in people’s lives. The Budget Advisory Service offers one-on-one sessions with a trained financial mentor, who will assist individuals, couples or families experiencing financial hardship to develop a strength-based plan. In Ashburton there is one full time, one part-time, and four volunteer financial mentors; who complete an intensive training course and attend supervision. The advisory mentor works along side people to organise a day-to-day and longer-term plan. This organisation of finances helps to create a healthy financial awareness, which can assist in avoiding many traps that people often experience. However, it is important for people to engage before there is a financial crisis: for example, where the power is being cut off that day, or rent payments have been in arrears for a number of weeks. This free service is located at the Trevor Wilson Centre, Presbyterian Support, at 215 Tancred Street Ashburton. If you would like to speak with a Budget Advisor please contact Presbyterian Support, for an appointment time and leaflet regarding what to bring to your first appointment. Appointment times are available from Monday to Friday, 9am-4.30pm. We are excited to announce that the Seabrook Mckenzie Centre, specialising in children with specific learning disabilities (e.g. dyslexia, dyspraxia), now has an office open in Ashburton. Local families who wish to have their children assessed, no longer have to travel to Christchurch to do so. Instead they can make an appointment at Seabrook Mckenzies new office base at Community House. This project has been made possible through the passion of generous donors who wanted to do something to make a difference to children with specific learning disabilities who often struggle at school. Advance Ashburton consider it a huge honour to be able to facilitate connecting the passion of our donors with projects that can make a difference in our community. Advance Ashburton Trustees are delighted to be able to make a contribution towards the building of the Christchurch helipad. Recognising the objectives of the Foundation, and understanding that the helipad project would benefit our rural community significantly. Critically-ill or injured patients from Mid-Canterbury, who are often first assessed and stabilised at Ashburton Hospital, need to be transferred to the trauma centre in Christchurch as quickly as possible. Advance Ashburton is very proud to announce Fleur Mulligan as the recipient of our first Leader’s Scholarship. The new Leader’s Scholarship provides an opportunity for an individual wishing to continue their leadership and personal development journey. Fleur has already achieved much. She has worked in Central Government, local Government and is now a banker. Meanwhile, she has held, and still holds, leadership roles in many community organisations as well as a business with her partner. As a recipient of our first Leader’s Scholarship, Fleur will be undertaking the Essentials of Directorship with the Institute of Directors. This first Leader’s Scholarship was funded from proceeds made from a Breakfast Fundraising event with Sir Stephen Tindall, held in November 2017. You may recall back in 2016 one of our donors enabled us to purchase SimMan and SimJunior for our hospital. These realistic, full body, lifelike mannequins feature true vital signs and chest movement. They make sounds and their limbs are fully articulated. The mannequins are operated remotely and wirelessly. In realistic scenarios, our doctors and nurses practise detection and stabilization of rapidly deteriorating adult and child patients. Since the mannequins have arrived, health professionals from other rural hospitals throughout New Zealand have also come to our hospital for this simulation training. With the feedback received from those participating, suggesting this training is one of the best they have completed. Because it is only through practice can outcomes for patients improve. Click on the link below to see a short video showing a snippet of one of these training sessions in action. You will see a very sick little boy in Ashburton Hospital being attended to by three trainee doctors (and Dr Lyons, who is the Ashburton Hospital Clinical Director, and who in the video, is substituting for a nurse). The boy’s symptoms worsen, and the young doctors must react. …..the tension is real. Training video using SimJunior mannequin. ​Without doubt the Kohanga at Ashburton College finished 2017 on a very positive note and captured the interest of many. Principal Ross Preece is one year and one term into the demanding position of leading Mid Canterbury’s largest secondary school and, with the backing of Advance Ashburton Community Foundation, has transformed the lives of a small group of troubled youths under his charge. The experimental classroom, fondly referred to as the Nest, was introduced to tackle head-on a complex and unique set of struggles faced by eight challenging students. We watched with interest and pride as this collaborative venture provided a lifeline to a group of Year 9 and 10 boys who had been identified as causing concern in the school. Such was the level of interest that following a presentation to an influential group of locals, Principal Preece was invited back to answer the question “what happens next?”. “At the end of term four all eight boys were still engaged in education,” said Ross with a great deal of pride. None were suspended and six were attending some mainstream subjects of their choice, which was a tremendous endorsement for all involved. Being responsible for the safety and wellbeing of over 1,100 students is not a role Ross takes lightly. For him it is not a numbers game where the individual needs of students go undetected, and for this Ross has quickly earned the respect and support of a large team of teachers and administration personnel, as well as the wider community. Kohanga teacher Lindsay Abbott remains at the coal face of this new and rewarding initiative, and almost 12 months on remains full of praise for the participants. Therefore, with the generosity of AACF, the strategy for 2018 remains unchanged – setting all students up for success. Thanks to the addition of a full time Foundation-funded teacher-aide, Ross and his team are better able to identify the best fit for those who struggle to integrate into the mainstream education system and keep them engaged in learning. MindPlus is a programme that provides intellectual, creative, social and emotional learning and support for children identified as gifted in our community. Currently there are forty-eight of our local children between the ages of six and thirteen who attend the programme where their gifts and talents are further developed and they gain a greater understanding of themselves. Each student attends the Christian School for one day per week where a specialist teacher delivers the programme in a dedicated classroom. This programme currently runs three days per week, with students coming from fourteen local schools. Specialist teacher Mel Simons says that many of the children present with learning difficulties, like dyslexia or dysgraphia, but have extremely high intelligence. The MindPlus programme removes the barriers for these children in their learning and celebrates their strengths – allowing them to extend their learning. As Mel says, the children feel included and behaviours are improving with the children being reflective, self-driven learners. “I feel it’s a place where I’m understood,” says one of the students. MindPlus is supported by the Mid Canterbury Principals Association and the NZ Centre for Gifted Education (NZCGE). NZCGE selects the children and provides the curriculum, teacher professional development and student support. The curriculum focuses on six learning strands: conceptual, personal, talent, research, complex thinking and communication development. It is designed to increase the breadth, depth, sophistication and complexity of learners’ knowledge and abilities in these areas and to increase self-learning. The programme is funded by parents and/or schools, with those not having the ability to pay missing out on the opportunity to attend. Through the generosity of our community, Advance Ashburton has given funding to support this programme by removing any financial barrier, so those that can benefit most from attending this programme will be able to do so. The Mid Canterbury Boxing Academy has been established to make a positive and long-lasting change in young men from all walks of like. The aim of the Mid Canterbury Boxing Academy is to turn young boys, youth, young men and adults into men who will demonstrate and live by the values taught: respect, responsibility, compassion, consideration, kindness, duty, obedience, honesty and truthfulness. Leading the training programmes is head coach Corneilius Grobler who was the 2016 Mid Canterbury Senior Sports Person of the Year and who also holds national and Golden Glove titles including being the National Welterweight champion. 92 males, between the ages of 9 and 18 currently attend the boxing Academy. Trustee Lisa Anderson said that they are taking a number of young men who are challenged with finding their place in society. “We have a number of young men that have been referred to us by parents, schools, youth workers and the police” she said. The early results in helping these young men turn their lives around are looking promising as some have made huge transformations. “We are here for the long haul and want to make a difference to our community by helping these young men find purpose in their lives,” she said. The Mid Canterbury Boxing Academy has received funds from the Tinwald Club Trust Fund through Advance Ashburton to assist with the set up and running costs. The Academy is governed by the Mid Canterbury Youth Charitable Trust which has modelled itself on the well-known Naenae gym established and run by Billy Graham. en emigrating to a new country, the feeling of isolation can be compounded if they live in a rural location, and not having a driver’s licence greatly limits what can be done to overcome this problem. Thankfully, there is now a free programme available which has been designed to overcome this. Those charged with integrating farming families into our community have identified that many newcomers, especially women, do not have a licence. On top of feeling lonely and cut-off from support networks, they have trouble carrying out simple tasks such as getting to town for groceries, taking children to a doctor’s appointments or picking them up from school. “Let’s get you on the road” is the slogan behind the three-year pilot programme known as the Mid Canterbury Newcomer Rural Driver Licensing Scheme. Free to participants, the programme has been designed to: create safe and confident new drivers, increase their participation in the community and encourage self-sufficiency and independence. Advance Ashburton Charitable Foundation granted $10,000 to The Rural Support Trust who, in partnership with Safer Ashburton District, have proudly introduced this exciting new initiative. Mid-March will see an initial intake of 12 women studying toward their theory learners licence and in time, move on to sit their restricted licence. Safer Ashburton rural driver licensing co-ordinator Wendy Hewitt said that while driver licensing courses have been available for quite some time, this is the only one she knows of which specifically caters for rural women, and in particular newcomers to the district. Take a moment to think of those living in your neighbourhood. Perhaps this is a good conversation starter and you could suggest they might like to contact Wendy at driving@saferashburton.org.nz. A renowned garden with international acclaim, Trott’s Garden, has been sold recently to the newly formed Trott’s Garden Charitable Trust to ensure this beautiful garden remains accessible to people both locally and from all over the world. The New Zealand Gardens Trust awarded Trott’s Garden six stars (its highest category) and designated it as a NZ Garden of International Significance, for its outstanding horticultural value in plant material, cultivation, design, construction, and maintenance. With the Trust taking over a garden of this size and scope, many keen gardeners have put up their hand to help keep the garden and lawns looking its very best. Plans for the Trust are being developed and include ideas for horticultural education, art classes, a bee discovery centre and an edible garden. Discussions are being held with other community groups who might be able to use the garden for their own charitable or community purposes. At the same time, Trott’s Garden will remain as a garden that will be open for public viewing and as a sought-after location for weddings, funerals and other special events. These activities will help to fund the ongoing development and future uses of the property. One of the first exciting developments was the installation of a permanent marquee as a venue for wedding receptions and other major functions thanks to the support of EA Networks. With the support of Advance Ashburton, the Trust has been able to employ a full-time gardener to work alongside the many volunteers who have given up their time and energy for this exciting new community project. BOOST is launching into its 5th year in 2018 and is established in 13 local primary schools with the 14th due to come on board later this year. The programme has 41 volunteers whom are tutoring 140 Mid Canterbury children aged between 7-8 years old. The results to date are incredibly pleasing. The Boost programme has improved children’s literacy by up to two years in just one year of being involved with the programme. We receive regular feedback from all parties involved, being the tutors, children, parents and teachers, and there is a resounding theme - not only has the children’s literacy skills increased, but there is also an increase in mathematics understanding and a huge increase in the children’s confidence, which is helping with social aspects of school life. Advance Ashburton is a very proud supporter of the Boost programme. Pictured from left: Jane Wright, Dr Sampsa Kiuru, a RHMS representing the University of Otago and Dr Steve Withington at Ashburton Hospital. Ashburton Hospital is becoming a Rural Health Academic Centre (RHACA) and is the first rural clinical education and research unit in New Zealand. Our Foundation, together with the Mackenzie Foundation, is funding for a three-year pilot period, three part-time positions for Dr Steve Withington, a Rural Hospital Medical Specialist (RHMS,) as the Senior Clinical Lecturer in Rural Medicine, Jane Wright, a Senior Clinical Nurse Specialist and Educator, and a Senior Research Analyst. Colorectal cancer is the second most common cancer and the second leading cause of cancer death in New Zealand. Rates of this cancer in New Zealand are among the highest in the world. The diagnosis of colorectal cancer is achieved by pathologists examining tissue samples under the microscope, which are obtained during a colonoscopy or surgery. Doctors will also establish how big the cancer is and whether it has spread to decide what treatment is needed for the patient. However, patients with apparently similar cancer types may respond very differently after receiving the same treatment, suggesting better diagnostic methods are needed for characterising this disease. There is now considerable interest in identifying molecular biomarkers that are able to better characterise colorectal cancer and guide therapy more accurately for individual patients. While a number of biomarkers have been explored by researchers, few have been implemented in routine clinical practice. Arthur Morley-Bunker is currently studying a PhD in the Mackenzie Cancer Research Group (Clinical Director: Professor Bridget Robinson) and is using a new molecular technology that can uncover potential biomarkers, and become a new tool in diagnostic laboratories. Arthur was the first person in New Zealand to develop expertise with this technology which he is now using to examine a particular type of molecule known as RNA. He is being supervised by a research team of cancer experts, including Dr Logan Walker (Cancer scientist), Dr John Pearson (Biostatistician/bioinformatician), Dr Margaret Currie (Cancer Scientist), and Associate Professor Tim Eglinton (Consultant Colorectal Surgeon). Our results to date have found RNA biomarkers from two genes that may be linked with a more advanced cancer. By assessing molecular changes down a microscope, Arthur has noticed that tumours from patients who have poor prognosis, contain less of these RNA biomarkers that tumours from patients with a better prognosis. A challenge with measuring changes under the microscope by eye is the possibility that different people looking may generate slightly different measurements. To overcome this problem, Arthur is also exploring computer based methods that provide a better assessment of microscope images to for a more consistent measure of biomarkers. Our research goal for 2017 is to understand more about how two RNA biomarkers contribute to the development of cancer. Arthur will be using the Glassey Trust Fund to carry out an array of laboratory experiments to uncover why a reduction in particular RNA molecules might give rise to more advanced tumours. Our ultimate hope is that this new information may lead to better patient management, and also to guide the development of new therapies targeting tumours with these molecular changes. We are very grateful for the opportunity to use these funds for our colorectal cancer study and wish to extend our thanks to the Advance Ashburton Community Foundation. I am 17 and I am currently studying Automotive level 3 at Ara Timaru Polytech which I am really enjoying. I am working the rest of the week at Autosparks. I was very fortunate to receive a Tinwald Club scholarship which enabled me to purchase a full tool kit for when I'm at work which is very useful. I am very thankful for this scholarship that I was awarded by Advance Ashburton and the Tinwald Club Fund. I am currently completing my Masters of Science majoring in Environmental Science at the University of Canterbury. Receiving an Advance Ashburton Scholarship has been incredible in reducing the additional financial expenses I have incurred as part of my masters project. It has allowed me to focus more of my time and efforts on my studies. Advance Ashburton itself as a community, have also provided me with a network of people that have been fundamental in the completion of my masters project. I’m currently finishing my second-year as a Victoria University of Wellington student, undertaking a conjoint Bachelor degree of Law and Arts (Humanities). Being a second-year student who fully relies on scholarships and support from parents to pay for tuition and materials, it is important for me to search for as many scholarships as I can to ease the difficulty for my parents -- receiving an Advance Ashburton Scholarship, this year has helped to do just that and contribute as a stepping stone to reach my goal to be a practicing lawyer after I have graduated from Victoria. For the moment, taking a paper on Tort Law has captured my interest and made me consider civil litigation. I have been studying a Bachelor of Nursing at the Ara Institute of Canterbury and am absolutely loving it. I am currently on placement doing elderly care. Being on placement has reassured me further that this is the career I want to pursue after I conclude my studies. I have put the scholarship to good use using it for text books and equipment needed for my course. I am very grateful to have received the scholarship and I could not have made it this far without the help of Advance Ashburton Community Foundation. I am currently studying a bachelor of AgriCommerce majoring in International Agribusiness at Massey University in Palmerston North. This is a 3 year degree of which I am 1/6 of the way through. Last year I received the Parsons family trust Agricultural/Horticulture scholarship to help towards my studies. Once I complete my degree I hope to be employed in the New Zealand primary sector working in either Agriculture or Horticulture. Specifically I wish to be involved in New Zealand's Export market and be able to showcase and market our products around the world. Receiving the Parsons scholarship has helped me hugely as it has allowed me to focus on my studies and not worry as much about financial support. It has given me confidence in what I study as I know that I have the support of the Parsons family. After receiving the scholarship I went and visited them on their farm and still keep in regular contact with them. Receiving a scholarship specific to the Mid Canterbury community also gave me motivation to work hard here at Uni as I feel that I owe it to the community to give back at some stage in my career. After initially being nervous about spending so much time with strangers, Nicola soon found that these strangers quickly became friends as well as an amazing support network to each other throughout the course. By letting go of being in control of the situation Nicola and her watch group learnt how to get the most out of their experience as they participated in several activities and challenges from learning to sail, kayaking in the sea and in rapids, high ropes courses, hiking, solo and group sessions. Advance Ashburton has proudly been supporting the BOOST child literacy programme since it was originally trialed in 3 schools in 2014. Coordinated by the Ashburton Learning Centre, the success of this programme has led to considerable growth since it began and the programme is now being delivered in 10 local schools. 27 volunteers are trained as tutors to work alongside over 100 students to help enhance their reading and literacy skills. The programme aims to assist 7 and 8 year olds whose literacy skills are behind their peers, but the extra support they need is not available under the state school system. Volunteer tutors go to the schools to deliver a highly effective, research-validated programme, which the children and the results are showing is helping them with the fundamental literacy skills they need to succeed. Children on the programme receive tuition twice a week, for a 30 week period. The schools are eager to be involved, tutors enjoy being part of the tutoring team and most importantly the children have shown they make great progress. The Ashburton Learning Centre has been well supported by local schools and receives funding from Advance Ashburton and the Mackenzie Charitable Foundation. The sun shone and the music played, as five thousand people packed into the Tinwald Domain in celebration of Children’s Day on Sunday March 6th. Chairperson of Mid Canterbury Children’s Events and Activities Trust, Lorayne Oakley, said the vision for the day is to see children celebrated, nurtured and treasured by all. Celebrated annually throughout the country, the event in Ashburton is a free day of child-centred fun activities including rides, face painting, crafts, gymnastics and a BBQ. The trustees for the Tinwald Club Trust Fund, administered by Advance Ashburton, were delighted to encourage positive relationship between adults and children, by making a grant to help cover costs of the event. Park Street Day Centre is a service run by the Canterbury District Health Board for older members of the Ashburton community. The extra care and socialisation during the day enables them to live in their own home for longer. The Centre is open every weekday and offers a range of services: socialisation, support for carers, craft and handwork, assistance with skills for daily living, recreational activities and outings. The Day Centre is renowned for its individual care of patients and offers the additional service of picking up and dropping home the people who use the service. Advance Ashburton along with Pakeke Lions is proud to have supported the purchase of a new van to help continue the work of this wonderful community service. I am writing to thank you for the generous $2,000 Advance Ashburton Health Sciences Scholarship. I was very happy and appreciative to learn that I was selected as the recipient of your scholarship. I am a 5th year medical student at the University of Auckland. I will graduate from my degree in late 2017. Thanks to you, I am one step closer to that goal. By awarding me the scholarship, you have lightened my financial burden which allows me to focus more on the most important aspect of school, learning. Your generosity has inspired me to help others and give back to the community. I hope one day I will be able to help students achieve their goals just as you have helped me. “One of the best parts of being a Trustee is being able to present funds to the Mid Canterbury community; to those organisations and individuals who will benefit from the money,” said Kevin Geddes. Kevin, who is retiring from the Foundation’s Board of Trustees, recently presented the latest donation of $8600 by Advance Ashburton to the Community House Charitable Trust. This funded the purchase of the telephone system for their new Community House premises. “Advance Ashburton has been very generous as they donated funds to support the purchase of the building and have now again donated for the purchase of our phone system,” said John Driscoll, Chair of Community House Mid Canterbury. Kevin Geddes has seen the Trust grow in the past ten years into the organisation it is today. He attributes this to three things: First and foremost the generosity of people in the Ashburton community. Secondly the inspired leadership and vision of the late Neil Sinclair, the first Chair of Advance Ashburton. Thirdly, the ongoing support of the Tindall Foundation which makes funds available to Community Trusts and approved community projects. Kevin feels that he has been privileged to be part of a remarkable group of Ashburton people who have built an organisation that has harnessed the inherent generosity of this community into an catalyst for positive change. Philanthropy is for everyone and our community is very much the better for the work of Advance Ashburton. After the 2011 earthquakes the buildings belonging to the Methven Library and the Methven Historical Society were unable to be economically repaired and strengthened. As a result the two groups have worked together to gain approval for one brand new building which should be completed in 2016. Support from the community has come in the form of donations towards the cost of the building. Advance Ashburton Community Foundation was pleased to hand over a cheque for $100,000. This was donated by the Lochhead Charitable Trust, which is now administered by the Foundation, specifically for this new Methven building. Rugby first brought Zimbabwean born Evans Chibanguza to Mid Canterbury, but after working at Silver Fern Farms and completing a post-graduate diploma in Social Work from Otago University he started work for Child Youth and Family as a care and protection social worker. Evans has recently taken up a new role with the Canterbury District Health Board as a social worker and family violence coordinator. He has seen first-hand how great the need is in the Mid Canterbury region. A few months previously, the chairman of the Advance Ashburton Community Foundation, Trevor Croy, and trustee, Mary Ross, had met with senior hospital management to see if there was anything specific that money donated to the foundation and tagged for health funding, could be used for. Yes, came the reply – to help us fund a position for a family violence coordinator. And so a need in the local community has been matched with a grant to part fund this new position for two years. Evans’ main priority is to get out into the community to create relationships with the other professionals who are at the coalface of family violence; the police, Child Youth and Family, Women’s Refuge, social agencies, the local midwives, schools and the Acute Admission Unit at Ashburton Hospital. Evans is the link between all of these groups, to coordinate information sharing which has been identified as one of the biggest obstacles when dealing with domestic violence in our communities. “I have long held the view that the one place that everyone should feel safe is in the home and so believe the issue of domestic violence needs to be wiped out. I am willing to do everything I can to make sure this happens,” says Evans. Advance Ashburton is delighted that the funds have been put toward such an important role in the community.